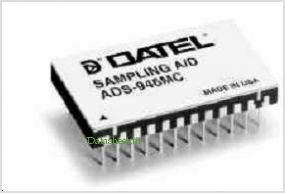 The low-cost ADS-946 is a 14-bit, 8MHz sampling A/D converter. This device accurately samples full-scale input signals up to Nyquist frequencies with no missing codes. Excellent differential nonlinearity error (DNL), signal-to-noise ratio (SNR), and total harmonic distortion (THD) make the ADS-946 the ideal choice for both time-domain (CCD/FPA imaging, scanners, process control) and frequency-domain (radar, telecommunications, spectrum analysis) applications. By C&D Technologies. This is one package pinout of ADS-946,If you need more pinouts please download ADS-946's pdf datasheet. 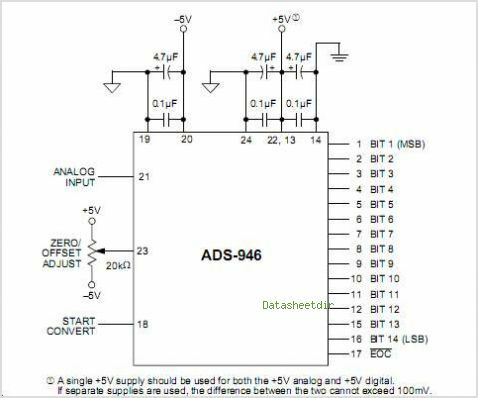 This is one application circuit of ADS-946,If you need more circuits,please download ADS-946's pdf datasheet.